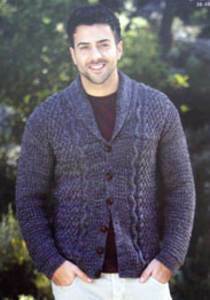 Men's knitting patterns in 4 ply, DK, aran, chunky and superchunky for sweaters, cardigans, waistcoats and more from top brands including Sirdar, Patons, Wendy, King Cole, James Brett and Stylecraft. 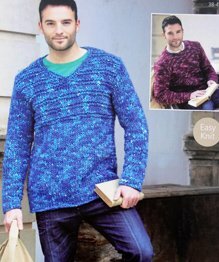 See (family knitting patterns) for even more men's knitting patterns and (mens digital patterns) for our range of men's knitting patterns to download. 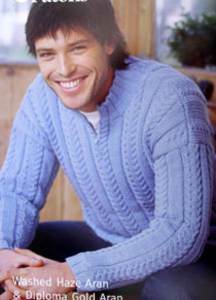 Sirdar 7336. 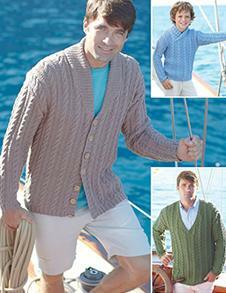 Mens v neck long sleeve cardigan with raglan sleeves shown in Sirdar Crofter DK and fits 97-122cm (38-48in). 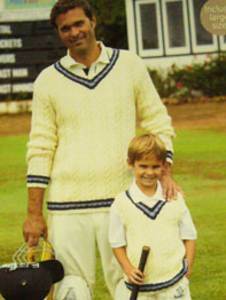 You won't get caught out with this classic cricket sweater and slipover with cable stripes and contrast trim, shown in Sirdar Click DK. To fit 61-117cm (24-46in). 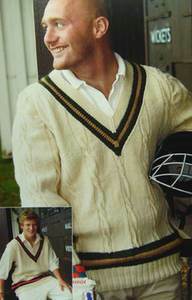 Cricket sweater and slipover shown in Wendy Mode DK yarn to fit sizes 86-112 cm (34-44 ins). 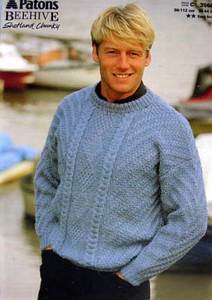 24sts/32 rows to 10cm, 4 mm needles. 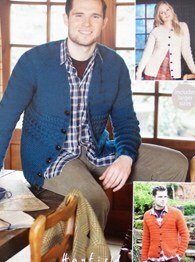 King Cole 3272. 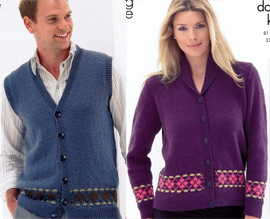 Ladies jacket to fit 81-107cm (32-42in) and matching mens waistcoat to fit 97-122cm (38-48in). 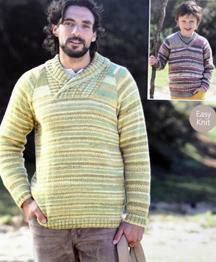 Both with fairisle patterned hem at bottom and shown in King Cole Merino DK. 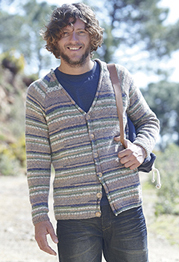 Man's cardigan with set-in, curved edge pockets, shown in Twilleys Freedom Echo DK recycled cotton DK. 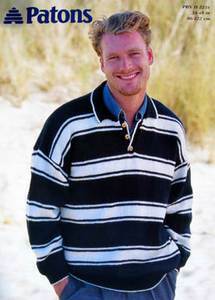 To fit 97-122cm (38-48in). 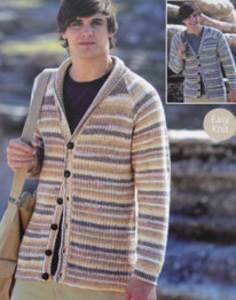 Easy V neck or shawl collar cardigan in brioche rib shown in Sirdar Crofter DK. 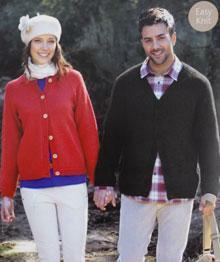 To fit 97-122cm (38-48in. 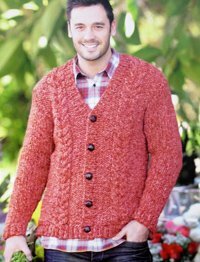 Cardigan with shawl collar has allover cable pattern to front and back and rib variation sleeves, shown in Sirdar Click DK. To fit 97-122cm (38-48in). 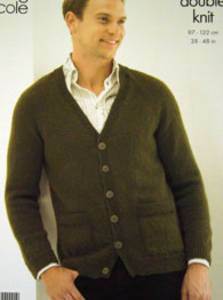 Easy V neck raglan cardigan for men shown in Hayfield Chunky with Wool. 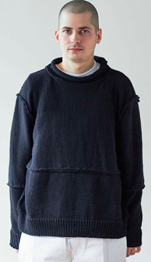 To fit 97=122cm (38-48in). Sirdar 9798. 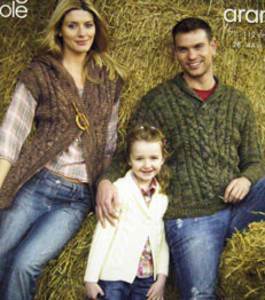 Mens and womans aran v neck, shawl collared and round neck cardigans to fit 81-137cm (32-54in) shown in Hayfield Bonus Aran. 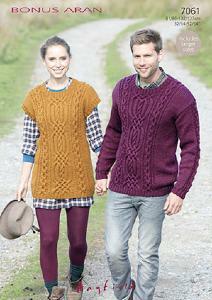 Raglan sleeved sweater with V neck or shawl collar shown in Sirdar Crofter DK. To fit adults and children 61-117cm (24-46in). Sirdar 9874. 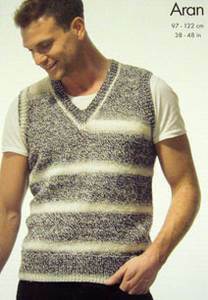 Mens round neck and v neck sweaters knitted in superchunky yarn to fit 97-122cm, 38-48in. 9st/ 12 rows to 10cm on 10mm needles. 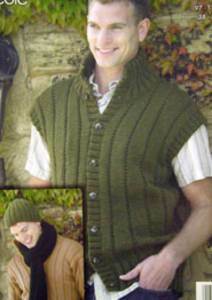 Waistcoat and slipover shown in King Cole Twist ombre shaded aran. 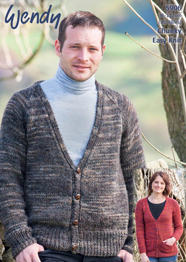 To fit 97-122cm (38-48in). .
Long sleeve sweater and gilet in mistake rib, with stand up collar, plus rib hat and scarf, in chunky yarn from King Cole, to fit 97-127cm (38- 50in). 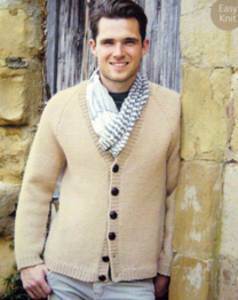 Classic raglan cardie with pockets and V neck sweater, shown in King Cole Merino pure wool DK. 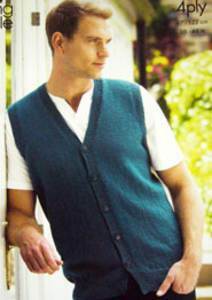 To fit 97-122cm (38-48in). .
Classic V neck waistcoat and slipover in 4 ply yarn from King Cole. To fit 97-122cm (38-48in). 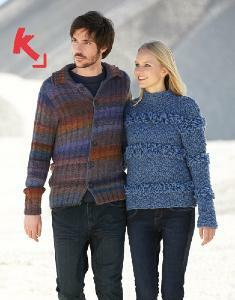 Patons zip neck cable sweater to fit 97-117cm (38-46in). 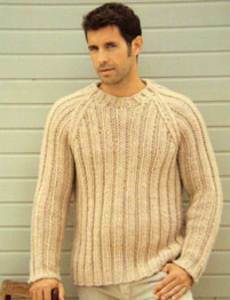 Knitted in aran, 19st/25 rows to 10cm, 4.5mm needles. 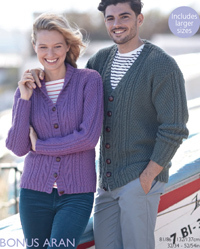 Classic raglan cardigan for men or women in aran yarn with v or round neck. 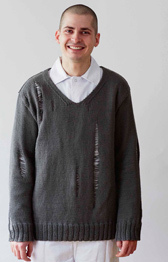 To fit 81-127cm (32-50in).